This stunning Spanish seafood black rice is one of my favorite dishes. For a seafood lover such as myself, it’s just perfect: jam-packed with seafood and strong ocean flavors. It speaks of summer and lazy days to me. As soon as the days started warming up I was back to my old love. I look forward to the arrival of the summer break like every overworked parent. No more getting up early, no more running around chasing lost shoes/homework/books. Yay! And welcome traveling. So here’s to summer, wherever you are. Let’s enjoy the break and create new memories. It’ll be fun. Spanish Seafood Black Rice Recipe: Not only does this dish look stunning, it also tastes heavenly and is packed with delicious shellfish. Place fish heads, shrimp peels and heads, saffron, bay leaves, garlic, onion and parsley in a large stock pot. Add 1 quart of water. 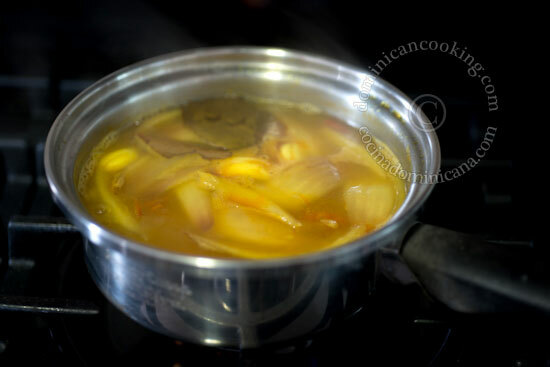 Simmer over low heat for an hour, adding water as it becomes necessary to maintain the same level. Remove from the heat and sieve to get rid of solids. Reserve broth (you should obtain 1 quart). Add bell pepper, tomato and peas. Cook and stir for 30 seconds. Add olives and ink, mix well. Add broth. When it breaks the boil add rice and mix well. Simmer until almost all the liquid has evaporated. Add shrimp, squid, clams and mussels. Mix well. Lower heat to very low, cover with a tight-fitting lid and simmer for 20 mins. Uncover and stir, moving rice at the top to the bottom and viceversa. Cover and again and simmer for another 5 minutes. Rice should be firm but cook through. If it becomes necessary cover and simmer for another 5 minutes. The original dish calls for arborio rice, but I prefer using long-grain rice instead. This looks delightful and I plan on trying this soon. The black rice recipe looks very appetizing and sumptuous, except the shrimp will look beter if they are cleaned and deveined. Love your Dominican recipes! These are not wild shrimp, they don’t need to be deveined, they’re clean, the black stuff is from the ink. Ah, this is like a spanish paella? It looks very good, i love seafood. Looks good – I can almost taste those ocean flavours over here!